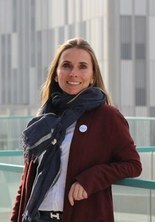 Cristina Canal Barnils (Barcelona 1977) is Bachelor in Chemistry (UAB), Master in Research, Development and Control of Drugs (UB) and PhD in Textile Engineering (UPC). She is currently Ramon y Cajal Fellow (Department of Materials Science and Metallurgy, UPC). Before joining UPC she did different research stages at pre and postdoctoral level in different national and international research centres. She has participated and lead a number of research projects, as well as technology transfer projects in the areas of Textile materials, Biomaterials and Cold Plasmas. She is co-author in many JCR papers in scientific journals, as well as book chapters and patents and has issued many Conferences. She has received different awards, including the L’Oreal-Unesco fellowship “For Young Women in Science” (2012). Her interests are focused in cold plasmas for biomedical applications, especially: i. surface modification of biomaterials to control parameters such as adhesion or biological behaviour; ii. Control of drug release from biomaterials; and iii. Therpauetical appications of cold plasmas, for instance, in bone cancers. She is currently ERC APACHE project Starting Grant leader in a project related to atmospheric pressure plasma therapy with biomaterials for bone cancer treatment.